The buildings featured in Pinnacle serve to catapult the University and the surrounding community to their meridian. We are introducing affordable, safe, quality housing. The new, suite style residence halls are progressive in nature and will create an atmosphere where students are able to prosper and succeed. The elements included in the dormitories will shape students learning outcomes in a positive way by presenting them with modern amenities tailored to aid with academics, accessibility, and recreation. These amenities include lounge areas, study rooms, private bathrooms, laundry facilities and a host of new, student programs. By leveraging private sector innovations and efficiencies in the design, construction operation, and maintenance, we will develop a long- term relationship between institutions and developers that attract students to live on campus while enhancing their college experience. Residence halls and recreational facilities can send a strong message on how the school values their students. Facilities on campus are symbolic in setting the culture’s tone. Dilapidated facilities, poor lighting and lack of technology when merged together may cast a negative shadow on the university which could show a lack of care. It is FAMU’s mission to deliver excellence with care. Pinnacle is an embodiment of that mission and will deliver a progressive yet affordable housing solution that includes modern amenities necessary for the success and care of students. Housing and on-campus facilities have been connected to shaping students learning outcomes while outdated structural features can undermine learning. Modern designs and décor is known to have a positive influence on student achievement and retention. The Development will execute more than just student housing but introduce the creation of a living-learning community, which has a high impact on graduation rates and would establish a firm presence to receive stronger investments in higher education from the state. The Jake Gaither Stadium opens to the rest of the new south campus. This new, state-of-the-art establishment will be half dug into the sloping terrain, with a series of terraces accenting the building, allowing for crowds to enter from the campus. During a game, fans have full 360-degree access to the concourse. Rising from the field in three tiers, this 35,000 seat stadium pulls fans as close to the field as possible while keeping optimal site lines. The stadium will remain flexible for other sports such as soccer and lacrosse while featuring 20 Leasable Luxury Suites, 4 Non-leasable University-Utilized Luxury Suites, 16 Lounge Boxes, 1,076 Premium Club Seats and 3,000 Priority Seats. A successful athletic program could increase prospective students’ interest in the university for both athletes and non-athletes. The project will position the heart of Pinnacle to feature a multi-purpose stadium accented by an indoor practice building and athletic facility. We know that by improving the intercollegiate student athlete experience and positioning them for future success, that the results could have a rippling effect on FAMU by attracting athletes, community members and sports fans. A successful football program has been known to establish a positive correlation to student recruitment, retention rates, and social development. This is described as the “Flutie Effect”, which explains how a successful collegiate athletic program has a positive impact on the number of applicants looking to attend the University and after experiencing the unification culture of attending these events, they have a positive effect on keeping students at the university. We expect the University to employ these benefits that have been proven to occur with the success that can be attributed to bettering sports programs. The boutique hotel and conference center will be anchored to the stadium while giving guests private access to the stadium club for a great game-day view and event festivities. It will feature a conference center and excellent view over the Pinnacle. Hotel owners want to move closer to universities because they fall into the sphere of influence and act as a stable source of business with predictable seasonality. This will serve as an ideal location for recruiting athletes as well as visiting parents, professionals, and individuals. The conference center itself could be used to host interactions between corporate clients and the University. The relationship the University has with the hotel will foster a lasting partnership that could strengthen the quality of student and university backed events. There has been a surge of Mixed-Use developments coming up across the country because of high demands. Pinnacle will allow for retail, eateries and other businesses to utilize this infrastructure creating an ideal destination spot for students and members of the community. A mixed-use area will incentivize businesses to come to Pinnacle because of several reasons, some of which include increased tax revenue and environmental impact. This would encourage the University to take advantage of the unique design and features of amenities. The most compelling reason for businesses and FAMU to take advantage of this development is because there is a high demand from the people. The population yearns to live in a walkable, mixed-use neighborhood because it offers a strong sense of community. Individuals want to live in an area that has their necessities and recreational activities within walking distance or a short drive. This area will be a prime location especially on gamedays because people are looking for something to do before and after the event. If we utilize the location of the stadium in regards to mixed-use & retail, the economic impact will be significant. By providing a central location where restaurants can flourish, the mixed-use development can help better the current food climate. Often universities choose to utilize mixed-use developments to vitalize areas and spur economic growth as well as enhance traditional university character. The mixed-use area in Pinnacle will act as more than the common shopping excursion but a location for leisure and union. We are not just proposing athletic facilities for student athletes but for students as well. The FAMU Athletic Training Center will incorporate state-of-the-art training and practice venues. Facilities will include a football training center, coaching facilities, meeting rooms, an indoor football practice facility, and an outdoor football practice facility. There will also be a weight room, equipment room, and several classrooms. The location of the athletic facilities immediately adjacent to the stadium will allow for easy access for players, coaches, and staff during practices and games. A holistic, revolutionary approach was established that allowed for the inclusion of athletic facilities which is linked to greater student success. This strategic design structured to elevate students provides an opportunity for students, athletes, and the University to succeed. This will also aid in solidifying top student athletes and students who expect more from a university. The students who utilize these facilities could acquire additional benefits backed by researchers that include the stimulation of brain cell development, memory retention, increase in focus and concentration as well as relieving stress. The implementation of these athletic facilities will be a driving force in student success and retention. Pinnacle proposes over 2000 new parking spaces. These spaces will address the shortage of spots available for students and faculty at Florida A&M University (FAMU). The parking will be strategically placed throughout the University. We will utilize a method that allows for the layering of architectural precast panels, reveals, and raised architectural bandings. Because safety and security are a priority, we want to introduce features such as open stairwells, glass backed elevators, greater floor-to-floor heights, CCTV, increased lighting and security call boxes. Additional amenities to be included that are popular in parking structures among students and environmentally friendly are daylighting, sustainable materials, bicycle racks, showers, reflective roofing, connectivity to public transportation, integrally-colored precast panels, low-mercury fluorescent or LED lighting, low spillage roof lighting, stained cement flooring, and television monitors that share building’s stories with visitors. A ground-breaking design that is functional, open and first-class. 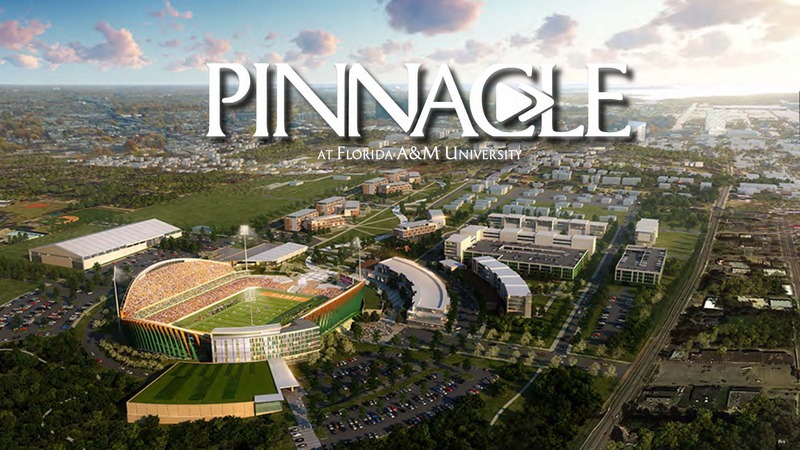 Pinnacle is designed to be a revolutionary and transformative project for Florida A&M University. This transition will embody FAMU’s tradition of excellence and solidify the values the university has in order to embolden a future of endless possibilities. 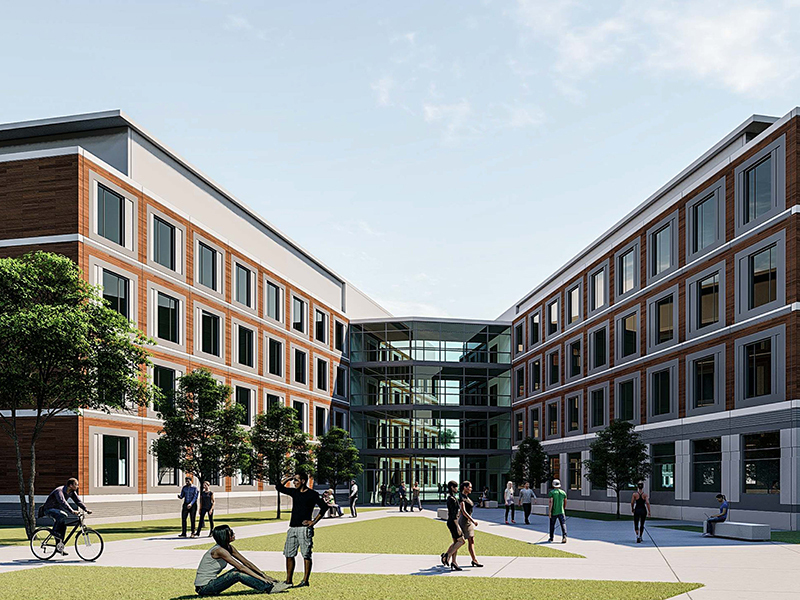 The development creates an innovative solution that serves as a catalyst for renewal along FAMU’s campus and is expected to establish the University as a pioneer for revitalization of HBCUs campuses throughout the nation. 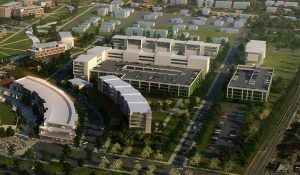 The master plan created by MANICA, envisions a range of facilities that will benefit the University as well as the City. 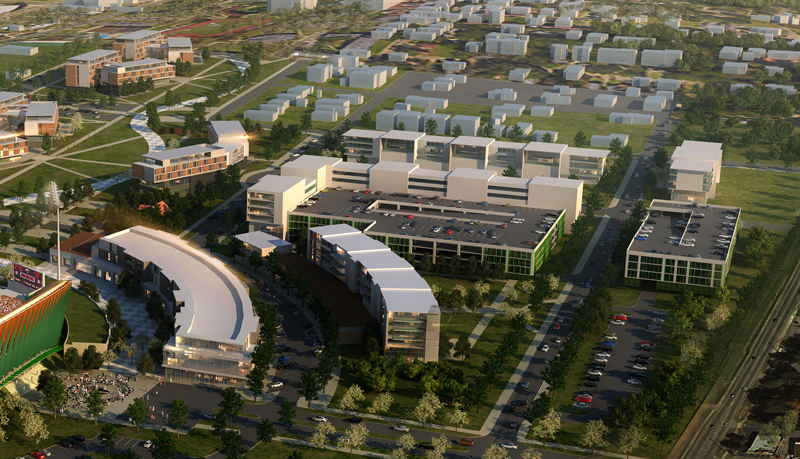 This includes new student housing facilities, athletic training facilities, and community athletic facilities. All of these components have been seamlessly linked to the FAMU campus by a highly active linear park system. This park system will incorporate areas for groups of students and residents alike to embrace the diverse lifestyle of the university and enable a better community experience. This area creates a vibrant destination for both students and community residents. We considered combining elements in a compelling way that attracts people through creative placemaking. We examined how to help shape not only the physical character of the project, but also its social character. In our design, we examined architectural and landscape strategies with intentions for green, open-space facilities that promote healthy, living-learning lifestyles while establishing a competitive location for new businesses and an exciting area for visitors. With hopes of embracing a healthy space, FAMU will serve as a leader and partner within the community to create a cross-disciplinary approach to urban development by incorporating healthy options into the built environment. These options include building sidewalks, creating safe pedestrian crosswalks, establishing recreational facilities and opportunities for walking and biking, as well as increasing access to healthy foods. CTG - A Development Company has provided specialized development and construction services from Sports Facilities, Parking Garages, Convention Center, Educational Facilities (K-12 and Higher Learning), Correctional Institution, and High Tech Facilities for our excellent clientele.